Red specializes in Direct & Mass Damage, Random Effects and hordes of Dragons, Dwarfs, Goblins & Orcs. Red draws it's power from mountains. There are plenty of large flying creatures. Red has good artifact destruction, and lots of spells to blast creatures into nothingness. One of Red's glaring weaknesses is that it has trouble dealing with enchantments. Green is the color of nature. Green draws its power from forests. Green's specialties are creatures & extremely fast mana growth. Elves are abundant in green. Green's creatures also tend to be less expensive than other colors' creatures of equivalent power. Green's mana quick creation and cheap creatures allow green mages to get large creatures into play very quickly. One of Green's glaring weaknesses is that it has trouble removing opponents creatures. Blue is the color of Wizard magic. Blue draws its power from Water. Blue specializing in countering spells, changing spells, and controlling spells. Blue has less creatures than other colors, and most aren't all that impressive in size. Blue's glaring weakness is it can have difficulty removing creatures and enchantments. As a beginner, blue can be among the hardest colors to play, but stronger players can scare the crap out of you with it when you go against a strong blue deck. They can really wreak havoc on your deck's strategy. White is the color of goodness and purity. White draws its power from the plains. White specializes in defense, healing and small dangerous creatures. Creatures include soldiers, spirits and angels. White usually has plenty of good enchantments at it's disposal. White's glaring weakness are lack of large creatures and lack of direct damage spells. Black represents death & decay. Black draws it's power from swamps. It specializes in creature destruction, forced hand discards, and a variety of large and small creatures. Creatures include Vampires, Zombies, Specters, Shades and Shadows. Black's weakness is dealing with enchantments. Now I'm not sure how many of you guys actually know this ... but the back of a Magic Card actually tells you which colors are designed to work together! In this illustration (created by Pojo writer EBM many moons ago), the thick green lines between the colored circles indicate the harmonious flow of Mana. Colors are most easily combined when aligned with their immediate neighbors. 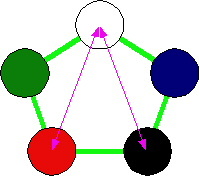 The magenta-colored arrows indicate disharmonious, opposing colors: in this case White is opposed by both Black and Red. So Wizards tries to make white work well with green and blue, and hate for red & black. You'll see a lot of examples of this when you look at your cards in detail. Perish affects only Green creatures, leaving the Black player who casts it with his army intact, and for the quite reasonable cost of just 3 mana. That's not saying that you can't make a powerful deck that includes opposite colors, because you certainly can. WOTC just tries to make it easier for you to combine neighbors, with great "Hate" cards in opposing colors. If there's anything else that you might find useful, feel free to contact me. Good Luck & Good Dueling!